Fireworks light up the Tuesday night sky over Hillsboro. 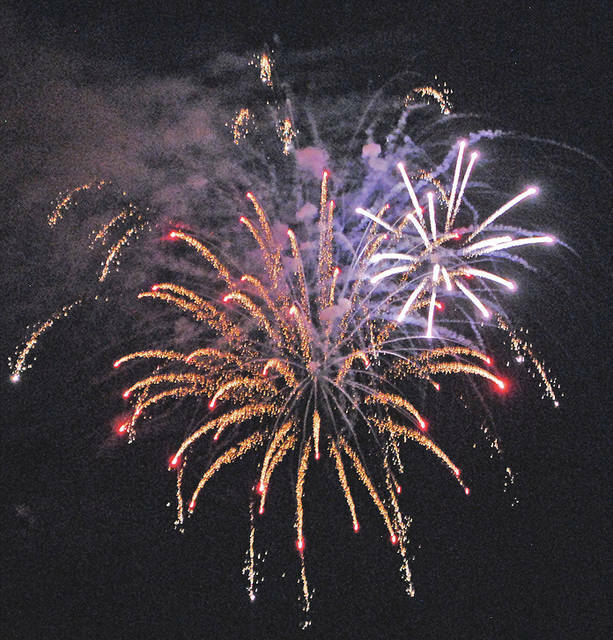 Fireworks provided by a host of sponsors were watched Tuesday from locations all over Hillsboro, and there are plans to make the display an annual show, event organizers said Thursday. Lewis guessed that as many as 5,000 or more people enjoyed the fireworks. The main viewing area is the large parking lot across Fairground Road from the fairgrounds. But another large group watched the fireworks from various locations at the old high school campus off West Main Street where people were playing Whiffle ball, football, throwing Frisbees and lighting sparklers before the show started. A group of people also watched the show from atop the Scott House on the old school campus. Fireworks were once an annual staple in Hillsboro, but were absent from the city for nine years before Lewis and others brought them back two years ago. Lewis said the City of Hillsboro helped with the cost of the fireworks, the Highland County Fair Board provided the use of the fairgrounds free of charge, and that if everyone who pledged to help with the cost of the fireworks comes through, the cost should be at least mostly covered. “We’re hoping everybody comes together next year to do it again. We’re hoping to make it an annual event for the city,” Lewis said. Those who helped fund the display included: the City of Hillsboro, State Farm Amatha Farrens, NCB, Railroad Tools And Solutions, Bear Mechanical, Jerry Haag Motors, First State Bank, Abbott Imaging Solutions, Southern Hills Community Bank, Weastec Inc., TEC Toyodenso, Merchants National Bank, Wilmington Savings Bank, Edgington Funeral Homes, Shelton Realty, Cork Services, Lewis Financial and Barrera’s Garage; plus Frog Blasters International, Christopher Lewis CPA, T&S Mechanical, Osler Medical Center, Dr. Jeff Beery, Railroad Tools & Solutions, Zach’s Towing, Highland County Republican Party, S&K Dairy Cup, Ervin Hill Sand & Gravel, Mark Edenfield Inc., Miller-Mason Paving Company, Brad Williams Farms, Sheriff Donnie Barrera, Holtfield Station, Cork Equipment & Construction and Dr. Rex Chiropractic. https://www.timesgazette.com/wp-content/uploads/sites/33/2018/07/web1_Fireworks-pic-1.jpgFireworks light up the Tuesday night sky over Hillsboro.